When eating out why are children's menus always sausages, burgers, chicken nuggets or fish fingers? These are great if homemade with quality ingredients, I make sausages and burgers for Bear, but they are boring and unhealthy when someone has just taken the food from a packet and served them with peas and chips. And they charge £££. I'm not a cook but surely they could do the same as the adult meal but child sized? Since Bear started eating solids the only way to ensure that he has appropriate food when we eat out is to take our own. That is great if the visit is planned and things go OK but what about the unexpected? When we overstay and would like to eat out. 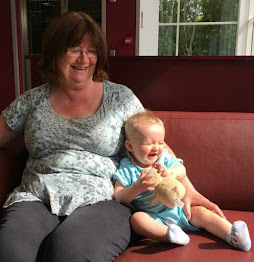 I thought I couldn't be alone in thinking this and started drafting this post a while ago after having lunch with Bear and his mummy at Sainsbury's. We hadn't planned to eat out but overstayed at the tots club and Bear was hungry. I was disappointed at the childrens menu, Bear likes fish and being in a supermarket you would think they could have fresh fish on the menu. No, so Bear had fishfingers. Picture of Bear eating spaghetti. (Just because he's cute). 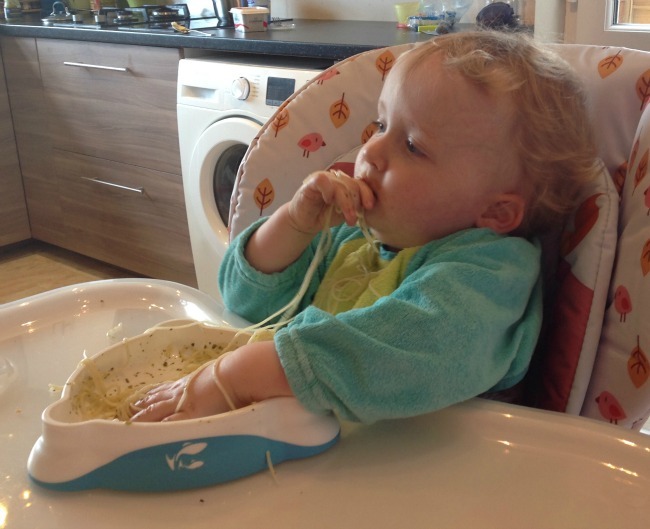 The post was originally titled Why Are Childrens Meals So Boring? Then on the news this week was a report about major chains and their kids meals. The report was in response to the release of The Soil Association 2015 Out To Lunch league table. 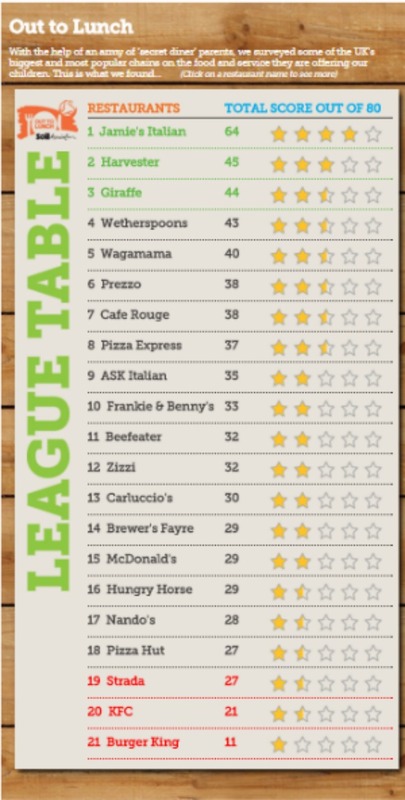 The league table includes 21 chain restaurants and pubs in the UK. When eating out I do not always think of these things, it's funny really because we only eat free range eggs and chicken. We have done for as long as I can remember. We also buy British meat with the Red Tractor wherever possible because we care about how our food is reared. Bears mummy is a vegetarian so I know she cares too. We also cook most of our (and Bears) food from scratch. We like to know what we're eating. "Over half of restaurants give no indication of where their food comes from. The campaign has found restaurants serving potatoes pre-mashed in Holland, fish fingers pre-cooked in Poland, chicken from Thailand and Brazil, cheese from Australia and New Zealand and a chicken product with 19 additional ingredients produced variously in Kazakhstan, Russia, Vietnam, Argentina, Malaysia, India, Singapore, Indonesia, China, Ukraine and Slovakia." What! Potatoes pre-mashed, I don't really care where they are mashed but pre-mashed! Fish fingers pre-cooked! I'm quite disgusted at this. When I'm eating out I expect my food to be cooked on the premises, the potatoes to be peeled, boiled and mashed and the fish fingers to be cooked in the restaurant's kitchen. Otherwise I might as well buy a ready meal from a supermarket and save myself some money. So now I know how awful it can be, who came top? Jamie's Italian. Not too surprising really as he supports decent food for children and is now campaigning against sugary soft drinks. I had a peek at his Kids Menu. This is the type of food I was looking for. It's a shame that the Soil Association didn't include supermarket and High Street store restaurants too as these restaurants are accessible and meals are cheaper. The full list is below, sorry it's a bit blurry but it's a screen shot. The interactive league table can be found here. Before writing this I had no idea there was a league table. 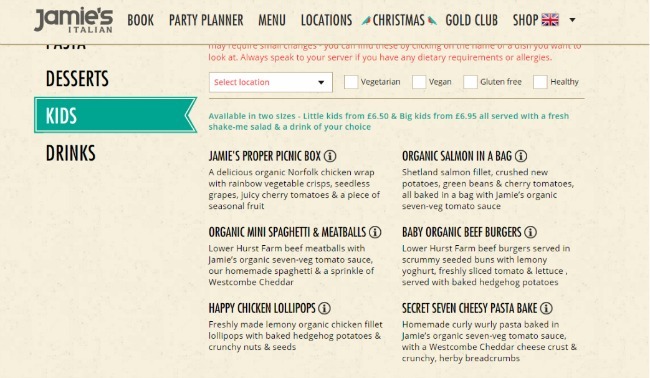 I have no links with either the Soil Association or Jamie's Italian and we haven't tried Jamie's childrens menu although Grandad and I have eaten at Jamie's Cardiff restaurant many times and we love it. Where do you like to take your children when eating out? I would love to know. To be truthful we don't eat at any of these places and certainly not with Bear. We like Jamies but at £6.50 it's a bit expensive for a 1 year old who throws most of his food on the floor. I am just disappointed at what is on offer for children. It's not easy is it? They could share our food but it usually has loads of salt and sugar, which we are trying to limit for Bear, if the childrens meals were same as adults but without the added salt and sugar that would be best. This is such an interesting post. The kids menu at Jamie's looks great. We went to Brewers Fayre today and I decided to order something off the menu for Aria, she had a hot dog which probably wasn't ideal but I did like the option to switch the side and opt for veg sticks instead. She loved chewing her way through those! I can't believe that Wetherspoons is one of the top rated, I would expect them to be a lot lower than that, I always give Aria my own food when we go there but will try ordering from the menu the next time.